AirBnB and Uber have proved that peer-to-peer "sharing" is a trend that is here to stay. In their wake we are now seeing a continuous flow of online services that help bring people with skills or goods to share together with those who need them. The travel space has particularly benefited from this new paradigm and London-based Zoolafix is one of the most interesting peer-to-peer start-ups we've seen recently. 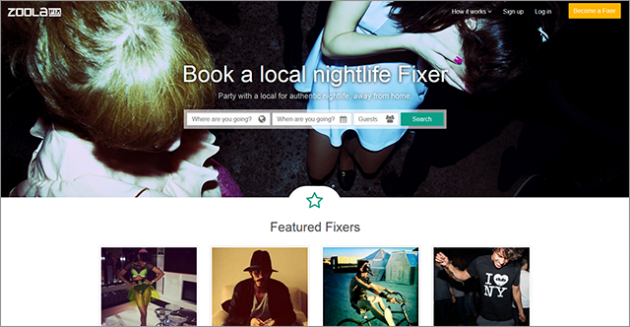 In short, the company offers a platform for “nightlife fixers” to hire themselves out. Fixers are well-connected experts in various cities around the world who take visitors out to party, and past the velvet ropes, at exclusive or underground spots that might be otherwise hard to get into. And while, theoretically, anyone can become one, Zoolafix puts prospects through a selection and vetting process that maintains the integrity of the site. For users, the fee can be anywhere between USD $50 to $300 per night. For some, that's a small price to pay to live nightlife like a local.